We all want everybody, regardless of ability, to live without discrimination, but many property managers run into uncertainties when it comes to The Americans with Disabilities Act. Make sure your property is totally compliant and accessible to all. The idea is simple, but often the details are not: The Americans with Disabilities Act (ADA) has improved the quality of life for millions of people. We all want everybody -- regardless of ability -- to live without discrimination, but many property managers run into uncertainties when it comes to abiding by this law. This post hopes to fine tune and explain the details of ADA, with the hope of making properties totally compliant and accessible to all Americans. To put it simply, through The Americans With Disabilities Act (ADA), discrimination against people with disabilities is prohibited in employment, transportation, public accommodations, commercial facilities, telecommunications, and state and local government services. It’s considered a civil rights milestone and a true victory for the human rights of all Americans. A disability is defined as a physical or mental impairment that affects one or more major life activities, including walking, bathing, dressing, eating, preparing meals, going outside the home or doing housework. A disability can occur at birth or at any point of a person’s life. According to the most recent United States Census, 56.7 million people in the United States have a disability, representing 19 percent of the civilian noninstitutionalized population. The American Community Survey reports that, from 2008 to 2012, the number of people 65 and older -- 15.7 million people, or 39 percent of the population -- have at least one disability. Two-thirds of this group had difficulty walking or climbing. The second largest disability in this group is difficulty with independent living. In 2010, the ADA Standards for Accessible Design set minimum requirements for newly designed or altered facilities. Yet even with further clarification, property owners and managers still often have questions about compliance. For instance, a common misperception is that properties are required to have a certain number of ADA units. While public spaces like the leasing office, parking lot and other common areas need to be ADA compliant, the law does not apply to the individual dwelling units. Note the larger distinction: residential properties are exempt from ADA requirements, but leasing offices and any other facilities used by the public are not. These include schools, retail stores and malls and hotels and motels. Keep in mind: building “ADA exceptions” into your lease, or putting the burden of compliance on the tenant, does not excuse you from ADA compliance. You are definitely responsible for all ADA alterations considered “readily achievable” on your property and should therefore do your due diligence to ensure that you are in compliance (this is particularly true in common areas). What’s an often-overlooked area when it comes to ADA compliance? A cab large enough to accommodate a wheelchair and its 360 degree turn. Two-way communication, easily accessible and utilized. In fact, the International Building Code (IBC) released a new requirement on January 1, 2018 specific to emergency elevator communication systems for the deaf, hard of hearing and speech impaired. This new requirement that focuses on the use of video in elevators to assist in successful communications applies to new construction and elevator modernizations. More on this code here. Have a pool on your property? Make sure you’re covering your bases. For pools, the rules include making the pool accessible by providing either a pool lift, a transfer system or a sloped entry (you can check out the rules in more detail here). Accessibility to all is an absolute necessity when it comes to your property. Be sure that you are taking the above measures to satisfy that basic necessity. 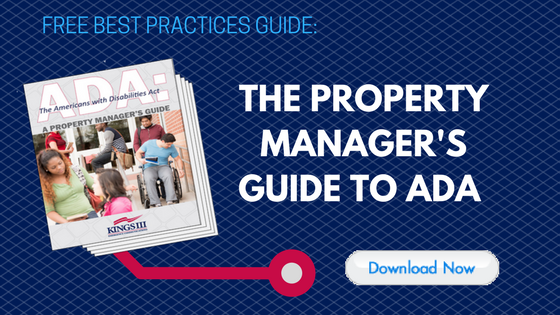 For more information and frequently asked questions regarding The American Disabilities Act, including how to get financial help for ADA compliance, see our free guide: The Property Manager’s Guide to ADA. Kings III equipment is designed to meet all ADA requirements. We can also customize our equipment to comply with any additional local and state requirements. Kings III provides code-compliant installation. Find out more here.